New moms Jessica and Samantha here again to combine our product testing skills with our roles as new moms to help you find the best, most functional, must-have baby gear to make your life easier as a new mom. 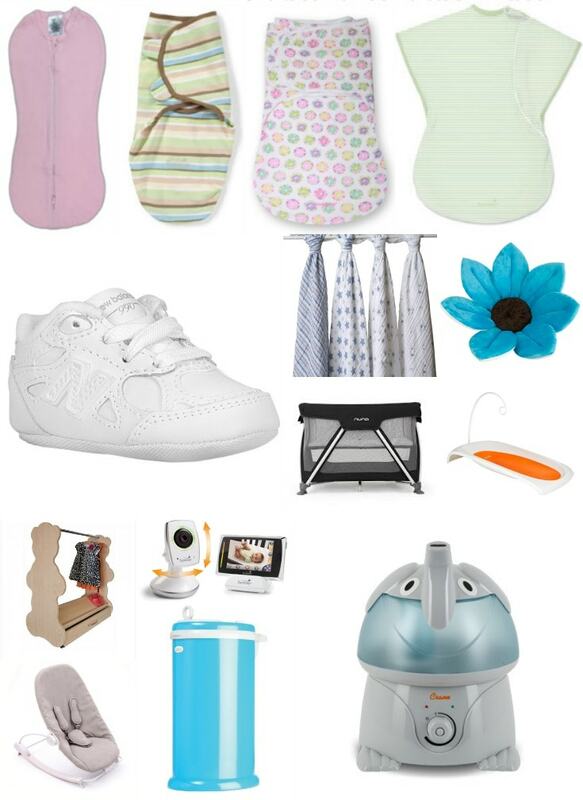 Yesterday in A New Mom’s Ultimate Baby Gear Guide, Part I we covered Eat, Drink, Stroll and Play. Now that we’ve covered some of the basics, it’s time to explore the baby gear that’s going to help you set up the perfect nursery and keep your little one cozy and cared for day and night with the perfect bouncer, swaddle, bed, humidifier and more to build the nursery of your dreams and keep your baby a happy camper. One of the least exciting but most vital components to any well stocked nursery is the diaper pail. When you’re out shopping for cute baby clothes no one wants to think about all of the stinky diapers that are going to come with your little bundle of joy but it’s a fact. Enter Ubbi here to take care of all of your diaper pail needs and make it a statement piece in your nursery instead of something you hide away. Ubbi diaper pails come in a wide array of colors and are made with stainless steel and a rubber gasket that seals odors in unlike conventional diaper pails made of plastic that beings to absorb odor over time. Ubbi diaper pails are incredible easy to load and best of all, no special bags required. I love that the Ubbi pails take the same bags as my kitchen garbage can because it means we don’t spend a fortune on “special” bags to make our diaper pail work, and because the Ubbi relies on the stainless steel design to trap odor in rather than special bags, the Ubbi is much more environmentally friendly than conventional diaper pails that use one bag per diaper. Ubbi is also a great option for parents doing cloth diapers and they sell a special reusable canvas bag that fits the Ubbi made especially for cloth diapering parents. Amazingly, the Ubbi pail holds 38-50 diapers at a time (depending on what size diapers you are using) and I am happy to report that even packed to the brim, I have never caught a whiff of dirty diaper smell in my little one’s nursery. As a bonus, Ubbi also makes self-adhesive and removable decal sets in 9 different design themes to make your cute diaper pail even cuter. The Ubbi diaper pail retails for $79.99. Why We Love It: This diaper pail is easy to use, traps in the smell from even the stinkiest of diapers and doesn’t require special expensive bags to work. What more could you ask for from a diaper pail? But Ubbi raises the bar and comes in a wide array of nursery matching hues to make it a cute and completely necessary addition to your nursery. Visit Ubbi online to pick our the diaper pail to match your nursery or check them out on Twitter, Facebook, Instagram or Pinterest. This changing table is as useful as it is cute to look at. The easy to clean foam pad means it quick and easy to clean up any messes the arise during diaper time without having to run a load of laundry and wait for a clean cover to be free. As a mother of a little boy I can tell you that this is a critical feature that has saved me a lot of time and a lot of loads of laundry. I love that the foam lining and raised sides and slip-resistant base help keep my little wiggle worm secure while changing diapers and the whole changing station is so lightweight and portable, it’s easy to toss into the car for long road trips or weekends away so I don’t have to worry about diaper time leave and messes behind while visiting family and friends. As a bonus, the FRESH Changing Station has a toy arm that arcs over the changing station where you can hang a toy to entertain your little one for babies who aren’t as cooperative during diaper time. The Boon FRESH Changing Station retails for $69.99. Boon also makes a cute LOOP Diaper Caddy (pictured above, right) to match which retails for $49.99. Why We Love It: No one likes to think about the mess that comes with your little bundle of joy, but this changing station ensures that all messes will be contained and easy to clean up while giving you a safe and easy place to change your baby. Bonus points for the toy arm that entertains babies who like to make a fuss at changing time. Visit Boon online to pick up a changing station that is entertaining for babies and practical for moms or check them out on Twitter, Facebook or Pinterest. A humidifier is a must have item for a baby’s nursery and the people at Crane have turned what was once a boring functional piece of equipment into something cute that you can’t wait to display with their new Crane Adorables humidifier collection. All Crane Adorables humidifiers like “Elliot the Elephant” (pictured above, left) feature ultrasonic cool mist operation that increases air moisture for easier breathing and a better night’s sleep for baby. Humidifiers in the nursery have been shown to help treat cold and flu symptoms, clear congestion and treat Croup in infants and toddlers. Additionally, humidifiers help sooth skin dryness and chapped lips which can be common in babies whose skin loses moisture at twice the rate of an adult’s skin. In addition to the health benefits of humidifiers, the soft noise that they emit serves as a wonderful white noise sound to help your baby sleep soundly during nap time and overnight. I loved that the cute humidifier saved me from buying an expensive white noise machine and helped keep the amount of gear I had to purchase and store in my baby’s room to a minimum. Additionally, because the Crane Adorables collection is full of so many cute choices, you’re sure to find the perfect humidifier to match your nursery that goes undercover as cute nursery decor when not in use. The Crane Adorables humidifiers retail for $39.99-$49.99 depending on style. Why We Love It: Humidifiers are a vital part of your baby’s nursery to help your baby stay healthy and Crane delivers a reliable, efficient humidifier that is as cute as it is functional and does it’s job while adding to the decor of the nursery. This is a perfect nursery addition for conscious moms who love products that do double duty in the nursery. Visit Crane online to pick our your favorite Crane Adorable for your nursery or check them out on Twitter, Facebook, Instagram or Pinterest. Picking the perfect furniture for your baby’s nursery is no easy feat, but it just got a whole lot easier with the cute pieces from ACE Baby Furniture. I fell in love with the cute furniture pieces and the mobile closets (pictured above right and left) are the perfect height to be reached by a child and just begging to be stocked with fabulous dress up clothes for hours of make believe adventures. Each ACE Baby Furniture piece comes in cherry, espresso, white and maple color options and you can choose between the teddy bears, lion and rabbit option so there is certain to be the perfect combination to complete your perfect nursery. As a wonderful bonus, all ACE Baby Furniture is made in the U.S.A.
My husband was on assembly duty for our mobile closet and he was happy to report that it was quick and easy for him to assemble. In addition to how cute they look, the wheels that make the double sided bookshelf mobile means that you can store twice the books in the same small amount of space while still being able to easily access them all. The ACE Baby Furniture pieces retail for $299.99 for the mobile bookcases and $249.99 for the mobile closets. Why We Love It: ACE Baby Furniture provides great mobile storage solutions for your nursery in cute animal shapes that give you nursery a unique look while providing functional storage space for your baby’s clothes or books. Visit ACE Baby Furniture online to find the perfect piece for your nursery or check them out on Twitter or Facebook. A great bouncer is a must have to both sooth and entertain your baby which is why the Bloom Coco Go is a must have for all new parents. The Bloom Coco Go features 3 positions and a two speed vibration meaning that there are a plethora of options to keep your baby comfortable and entertained while bouncing up a storm. The Bloom Coco Go rocks easily with a little help from mom or dad or can be bounced by the baby’s own momentum. The 5 point safety harness ensures that baby is secure in the bouncer no mate how much they bounce, bop or wiggle and the one push smart buckle makes it easy to get baby in and out of the bouncer. The seat pad is so soft and cuddly and easy to remove and machine washable which is a must have for any good piece of baby gear.The Bloom Coco Go weighs only 7.5 pounds and folds down flat into the included travel bag making it easy to pack down and take on the go, or just pack down and put away when not in use. I was amazed at how quick and easy it was to pack and unpack the Bloom Coco Go bouncer and even more amazed at how much my little one and I love this bouncer. My son loves to bounce and wiggle himself and is always so amused when he can make the bouncer move with his own efforts and he finds the vibration of the seat soothing both on it’s own or combined with the rocking motion of the bouncer. I love that the bouncer is easy to rock, so easy in fact that I can rock the bouncer with my foot and send my baby off to dreamland while simultaneously answering emails or grabbing a quick bite to eat. This bouncer is a lifesaver for any new parent and a must have to keep baby happy for those moments when mom or dad needs two hands. The Bloom Coco Go comes in white, cappuccino or natural colors and retails for $200. Why We Love It: This bouncer is a must have to sooth and entertain your little one and so cozy that your baby won’t want to come out of it. Bonus, I love that the Bloom Coco Go folds down flat into its travel bag quickly and easily to take on the go or just when you need a little more space around the house. Visit Bloom online to grab the ultimate design in portable baby bouncers or check them out on Twitter, Instagram or Pinterest. Pass any stroller in Manhattan and you’re sure to spot an Aden + Anais swaddle blanket, and for good reason, these are hands down one of the most versatile pieces of gear in your parenting bag of tricks. Aden + Anais swaddle blankets are made from 100% cotton muslin and are machine washable and seem to magically get cozier with every wash. One of my Aden + Anais swaddle blankets lives with my stroller where I use it to shield my little one from the sun or tent it over the stroller to create a cozy little area for when he naps when we are out on the go. The generous size of the Aden + Anais swaddle blankets make swaddling easy, especially as your little one starts to grow and gets too long to be comfortably swaddled in the traditional swaddle blankets. But the Aden + Anais blankets are so much more than just great swaddles. In my 8 short weeks as a new mom, I have used my Aden + Anais swaddle blankets as a nursing cover, a stroller cover, a changing mat, an emergency burp cloth and of course as a swaddle blanket. I can’t wait to discover what I can use my Aden + Anais swaddle blanket for next! Why We Love It: Is there anything these blankets can’t do? From swaddling to shading a stroller to play mats to wiping up emergency messes, this blanket is the work horse in your baby gear stash and one of the items you need to be sure not to leave home without. Visit Aden + Anais online for the ultimate swaddle blanket with a million and one uses or check them out on Twitter, Facebook, Instagram or Pinterest. For most moms we know, swaddling is sacred ritual that can transform a fussing baby and bring them to ease. When sleep is hard to come by, there is a definite must for a remedy, and Summer Infant offers a perfect solution for wrapping needs, and that phase when babies transition out of the traditional swaddle. Available in a variety of adorable prints and colors, every stage is met with a variety of designs to best suit baby’s preferences. SwaddlePod and SwaddleMe wraps are an excellent resource to soothe crying babies while also keeping them on their backs. Extending on this premise, Summer Infant recently introduced the SwaddleMe WrapSack, and the ComfortMe wearable blanket, extending the benefits of swaddling through the first year. The SwaddleMe WrapSack provides growing babies with additional legroom, and can be worn with their arms in or out, while the ComfortMe blanket provides large arm openings allowing for breathability and airflow, as well a convenient bottom zipper for quick and easy nighttime diapers changes. Why We Love It: The form and function of the Summer Infant Swaddle Collection reliably keeps baby bundled, without concern of unwrapping during the night. Cozy, soft, and adorable all wrapped in one, we’re just so happy to keep baby covered through the first year. Visit Summer Infant Online to learn more about the easiest and coziest baby swaddle on the market or check them out on Twitter, Facebook, Instagram or Pinterest. Our favorite travel bed has proven to be the Nuna Sena, with its easy one-handed fold design, minimal storage space needed, and sturdy construction. Chic without the clutter, the Nuna Sena is the only cot with an upper cot that folds with the frame. The carrying case makes for an easy on-the-go to Grandma and Grandpa’s (or wherever else you’ve got to go), and with an upper cot, makes reaching down to get baby, that much easier. The Nuna Sena retails for $199.95. Why We Love It: This quick open and close travel bed not only exudes style, it comes in two sizes, where the Nuna Sena caters to infants from birth to 3 years, and the Nuna Sena Mini, which takes up less space with the same function, can be used from birth to 18 months. Making for an excellent (and safe) playspace and crib alike, this is a household and beyond essential that comes in four shades (night, navy, safari, and scarlet), and will transition with you through the first years of babyhood. Visit Nuna online to get a jump on your next trip with baby or check them out on Twitter, Facebook or Pinterest. This multi-platform monitoring system goes above and beyond the expected. With a camera that can be moved in every direction remotely, a clear picture comes through day or night, and may zoom in and out. Equipped with a complementary 3.5” color touch screen monitor, viewers can keep a close eye from near and far over WiFi. A free Summer Link WiFi app is available for download to smartphones, and may be utilized as an additional viewing method for parents not in reach of the hand-held viewer, whether in the next room, or the next country. Providing peace of mind on a date night, or enabling grandparents and loved ones to see their favorite little person in real time, this item is the Cadillac of baby monitors. The Summer Infant WiFi Video Monitor & Internet Viewing System includes one camera and one hand-held viewer. Additional handheld viewers are available for purchase separately. This monitor retails for $314.99. Why We Love It: Transforming the smartphone into an additional monitor at no additional cost, it’s easy to check up on baby anywhere, anytime. Bonus features on the app make this monitor a clear favorite; temperature reads on the room to know baby is comfortable, zooming, rotation, and two-way audio capabilities, video recorder and snap pictures make this more than just a baby monitor- it’s also a mother’s helper that captures moments and memories as they happen. Additional cameras can be purchased for other rooms, and the viewer accommodates split screens to keep an eye on everything all at once. Visit Summer Infant Online to learn more about the ultimate baby monitor or check them out on Twitter, Facebook, Instagram or Pinterest. Made from soft, cuddly material, the Blooming Bath hugs any sink to create a safe and convenient place to bathe your baby without adding a bulky tub to the list of baby gear you have to store in your home. The Blooming Bath is so easy to use, just push it down into your sink and it mold to configuration of your sink to form a safe and cozy cocoon to bath your little one. I loved that the velvety fabric of the Blooming Bath didn’t get slippery when wet which made it much easier to keep a good grip on my squirmy baby as wiggled and giggled his way through bath time. After bath time is over, simply squeeze out the excess water and hang to dry in the shower using the attached hangtag or throw it in the dryer for 10-15 minutes and you’re done, no tub to drain or mess to clean up. The Blooming Bath is made with naturally antimicrobial fabric and foam interior and comes in an array of colors including turquoise, canary yellow and hot pink (pictured above, right). Blooming Bath retails for $39.99. Why We Love It: This colorful bathtub is a kid pleaser and a space saver making it perfect for anyone trying to stay space conscious in a sea of baby gear. Plus Blooming Bath’s machine washability means cleaning up from bath time is as quick and easy as cleaning baby itself. Visit Blooming Bath online to learn more about the easiest and most fun way to bathe your baby or check them out on Twitter and Facebook. Let’s be honest, crib shoes are strictly a necessity, but they are so cute that they should be! These tiny little New Balance 990v3’s are too cute for words and look even cuter on your baby’s tiny feet. Retailing at a very reasonable $29.99 these tiny sneakers make for a perfect baby gift or a perfect addition to your baby’s budding wardrobe. Why not start the shoe obsession when they’re young? Why We Love It: These New Balance sneakers in perfect miniature are a cute addition to any outfit in your baby’s wardrobe and the simple but chic colors ensure that they will coordinate with anything while keeping your baby looking ridiculously cute. Need we say more? Visit New Balance online to grab your baby the most fashionable footwear around or check them out on Twitter, Facebook, Instagram or Pinterest.